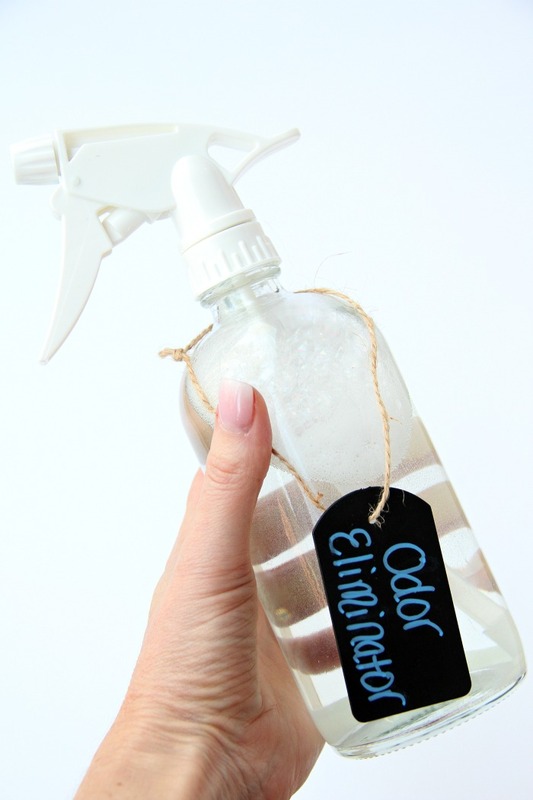 Homemade Odor Eliminator – This DIY odor eliminator is a lifesaver! Removes urine, pet and vomit odors from carpet, stuffed animals, furniture and more! As winter approaches, we all look forward to cozy evenings filled with Netflix, hot chocolate and lots of blankets. We find ourselves spending more time indoors than out with good intentions to tackle all of those home projects we didn’t get to throughout the summer. Of course, with the good, sometimes comes the bad: the inability to open windows to allow fresh air to come in, days and nights that are so cold our pets don’t want to go potty outside, and worst of all, flu season. 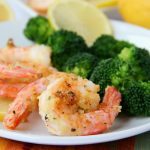 I thought right now would be the perfect time to share a recipe I have for a Homemade Odor Eliminator, so we all can “prepare” for whatever may come our way in the next few months.? This odor remover can be used as a spray or soaking solution for the stinkiest challenges. It’s the solution that will deliver when everything else has failed. 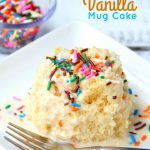 It’s really quite magical, and once you try it, you’ll want to share the recipe with family and friends and print out the recipe card to save for ALL TIME. Now keep in mind that this isn’t a STAIN remover. It removes STINK. So make sure that the affected area has already been cleaned and all that remains is basically. . .well, the smell. This is the solution you’re looking for if you’re trying to remove vomit, urine or another sort of stinky odor from rugs, furniture, car upholstery, car seat straps, etc. It’s the solution to use when you can’t throw “said stinky item” inside of the washing machine. 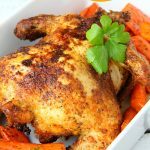 By the way, if you have stinky towels, clothes or blankets that you can’t seem to get the odor out of, this recipe works wonders. If it’s vomit or urine you’re dealing with, adding a cup of Borax to your washing machine along with your laundry detergent also is quite effective. Alright, so onto the solution for ALL THE THINGS that can’t be thrown into the washer but stink to high heaven. It’s probably pretty crazy when you think about how much we all have spent over the years on store-bought odor removing solutions. Oxy this and that. 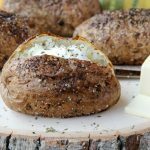 This recipe I’m sharing today is super affordable and simple to whip up in minutes flat. 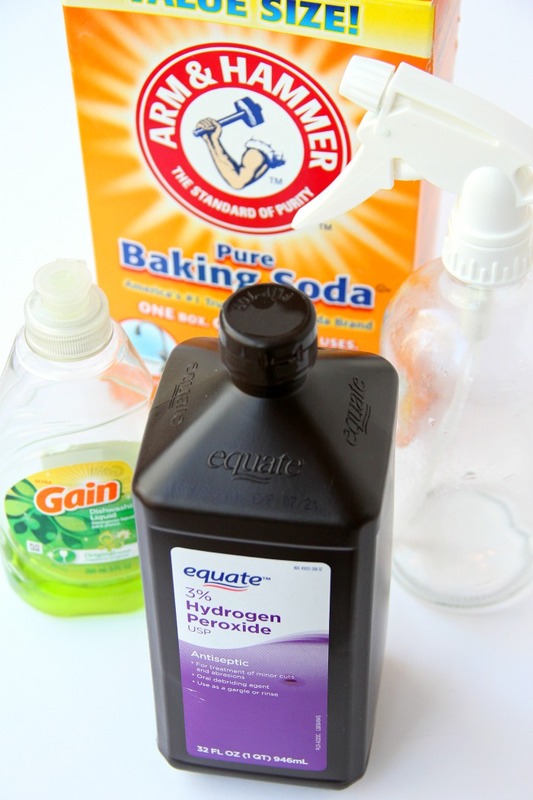 Fill your bottle with the hydrogen peroxide. Add the baking soda and the dish soap. Just kind of swish the spray bottle around (don’t shake it). 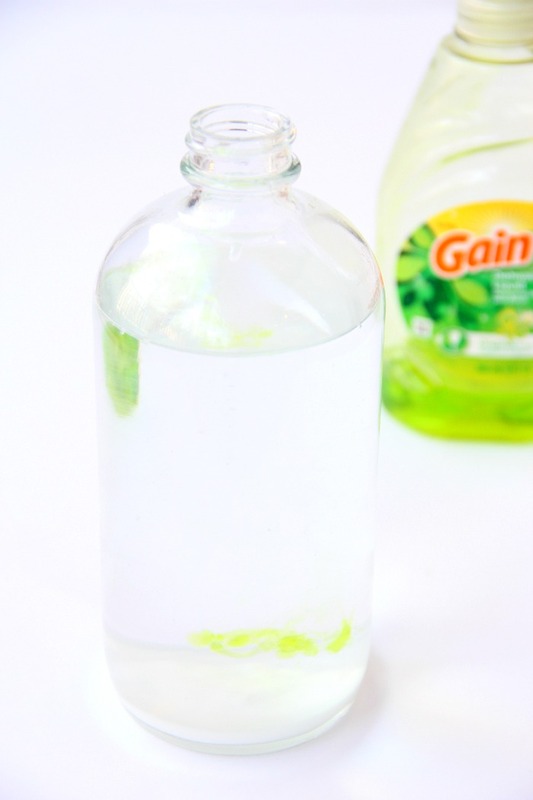 If you’re not using a spray bottle, then gently stir the solution in a mixing bowl or container. If you’re dealing with furniture or upholstery, the spray bottle may be the best solution. If you’re dealing with carpet or rugs, go for mixing the solution in a bowl and then soaking the affected area with the solution. This solution can be used on leather and fabric furniture as well as carpets. It’s always a good idea to test a small area before moving forward with treating the entire area. If you put the solution in a spray bottle, you may want to halve the recipe. Once mixed in the spray bottle, the solution should be used immediately. IT CANNOT BE STORED. You’ll find that the solution will begin leaking out of the spray bottle if you try and keep it in the bottle. 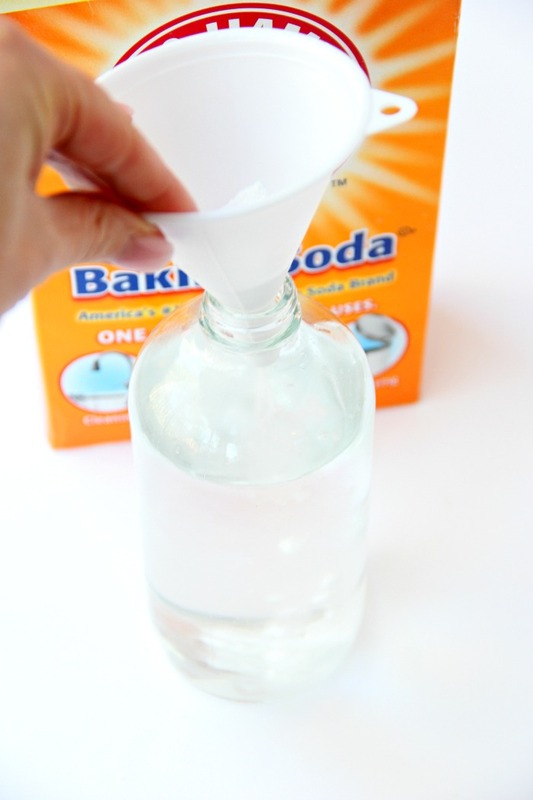 If you’re trying to remove odor from your carpet, sprinkling some baking soda onto the affected area after the treatment and vacuuming it up after about 15-20 minutes is a nice finishing touch. So, get a jump on preparing for any unpleasant odor experiences that may come your way this winter. 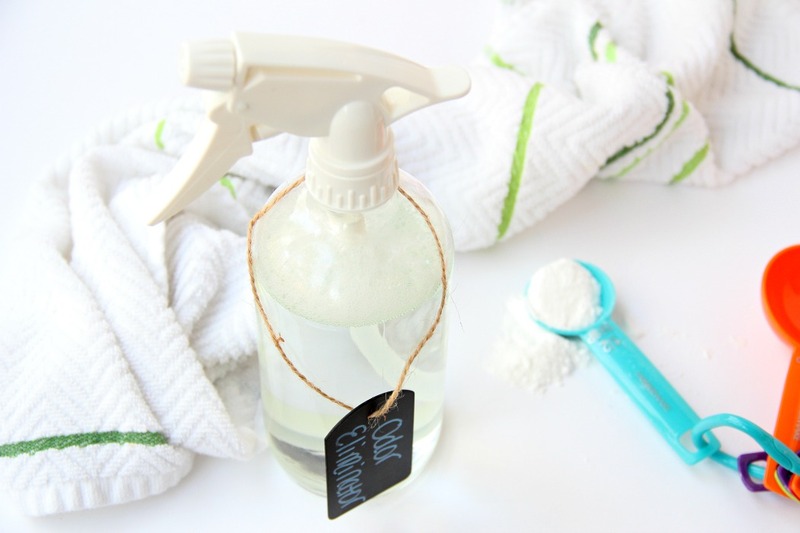 Whether it’s dealing with a sick child, incontinent pet or any other stinky challenge that may turn up, this homemade odor eliminator can be a god send. 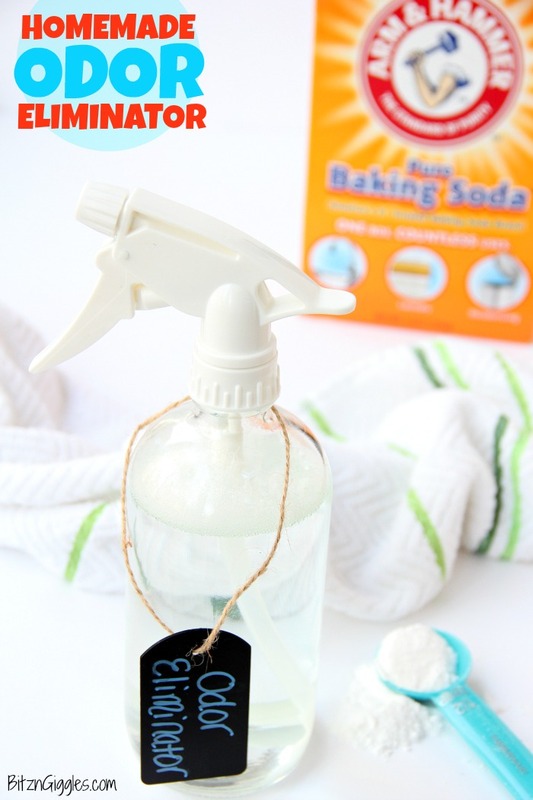 Need More Homemade Cleaning Solutions? This is great, I made up a batch the other day and my home is smelling nice for a change! I also put a few drops into the bag in my vacuum cleaner, now whenever I vacuum it leaves a nice smell on the carpet. If you have a bagless vacuum you could always put a few drops in the dust canister for the same effect.